I coded a large new website, NC Engineer, designed by Brian Hase, with overall project management by Richard Carden, for IIr Associates Inc. 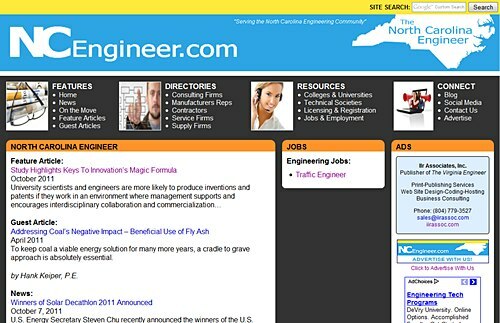 This weekend, IIr Associates Inc. launches the website NC Engineer. This website was designed by Brian Hase and coded by Jimmy Allen, with Richard Carden, IIr Associates Inc., handling Project Management. This large website is a hybrid of Textpattern CMS and our homebrew CMS, developed on the same model as the original in this series, The Virginia Engineer. The new website has a web page count of over 1500 pages, though of course templating and php scripts greatly reduce the number of different pages that I had to code. NCEngineer.com represents months of development, so we hope it takes off!